Former Flying Eagles coach, John Obuh has revealed that the duo of Mikel Obi and Odion Ighalo need to up the standard of their game in the Chinese Super League if they are to remain a key factor in the Super Eagles ahead of the team’s crucial 2018 World Cup qualifier against Cameroon. Mikel joined Tianji TEDA during the winter transfer window from Chelsea and has been struggling to keep pace with the Chinese League while Ighalo’s profligacy in front of goal continues with his new club Changchun Yatai F.C despite leaving Premier League side, Watford. Despite enjoying a regular playing time under Gernot Rohr in the Super Eagles fold, Obuh, who took the Golden Eaglets to the final of the FIFA U-17 World Cup in 2011, told Soccernet.com.ng that Mikel and Ighalo could be left behind in the team if they fail to raise the standard of their game. 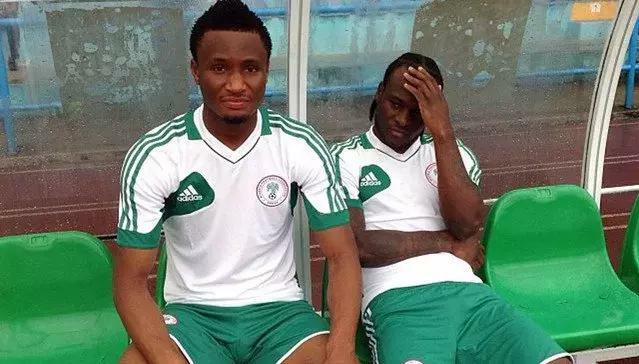 “I don’t think there is anything wrong for the duo of Mikel Obi and Odion Ighalo to have joined the league of stars that are playing in the Chinese Super League. Money may not be a major factor considering the fact that they needed regular playing time since Chelsea and Watford have seen them surplus to requirement,” Obu told Soccernet.com.ng. “I am particularly worried with them now because Nigerians seem to know anything about them again and their level of game in the league appears to have dropped, something that could cost them a place in the Super Eagles side that will face the Indomitable Lions of Cameroon. “Sometimes I imagine if there is real competition in the Chinese Super League just like what we see with clubs in Europe. I am not Rohr but I won’t be surprise if things turn out the way round for them; except if they raise the standard of their game,” he said.